We are delighted to announce a new, premium limited edition of writing instruments – EXTRA Argento. 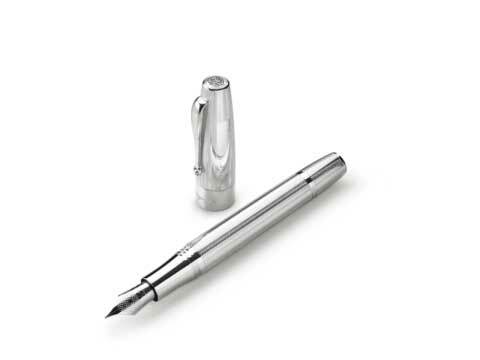 The iconic Extra model is finally offered in one of Montegrappa’s metals of choice: Sterling Silver. To add a special tailored look to this gentlemanʼs choice, the penʼs cap and barrel boast an intriguing herringbone tweed guillochè, skillfully engraved from top to bottom. We have left space to engrave and personalize this pen on the side of the cap. The Extraʼs sartorial elegance is further enhanced by the 1912 Montegrappa monogram crowning the pen cap, as well as the special engraving panel on the side of the cap. The new collection is offered in the classic formats of fountain and rollerball and, for the first time in the glorious Extra 1930 collection, as a twist-action ballpoint pen. Each of these three models will be available as a limited edition of only 1912 units of each. The Extra Argento fountain pen is piston-fed and features a large #8 18K gold nib engraved with the typical “Filigree” motif, fitted with an ebonite feeder. See the Extra Argento brochure here.